Fair Hours Update: On Friday, the fair will open at 4PM. 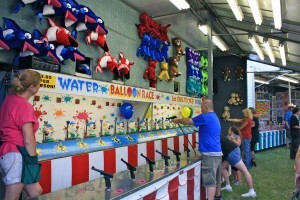 Saturday and Sunday, the fair opens at 12PM (noon) and on all days, the fair will stay open until 10PM. Tickets are only available on the day of the performance. Admission into the park is your ticket to the concert. No backstage passes are available. Seating is first come, first serve to all of the concerts. Lawn chairs and blankets are allowed for entertainment. It is up to the individual performers to decide whether to sell merchandise and participate in Meet and Greets. For further information, see our Frequently Asked Questions. Pets are not allowed unless for medical reasons. Alcoholic Beverages, coolers, and outside food/drink are prohibited on the premises. A beer garden is available for those over 21. No persons under 21 are allowed in the garden for safety and security reasons. There are NO EXCEPTIONS to this policy. Valid ID is required to enter the garden and alcoholic beverages must stay within the garden grounds. Speakers are available in the garden for listening to the Shipway stage performances. For further information, see our Frequently Asked Questions.